Is boxer Amir Khan planning for a comeback!? 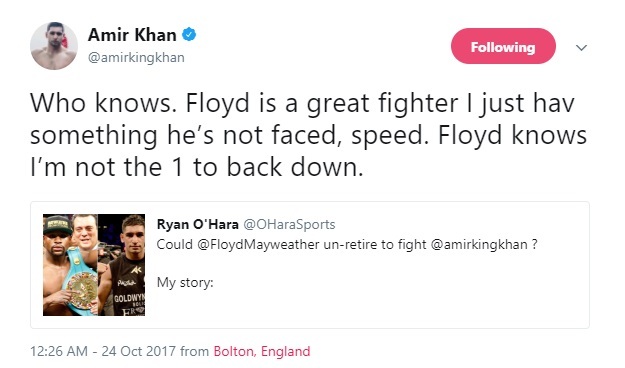 Has anyone seen recent tweets by boxer Amir Khan? Looks like he is planning for a comeback because he is talking about how great he is and how he was never outboxed by anyone. he may not have been outboxed by anyone but for sure he has a weak chin which will become hindrance in his plans of fighting big players! May be family problems were holding him back and now after divorce his mind is free and can focus on boxing. Who knows. mate that ship has long past sailed!!! Mayweather is 50-0, retired and already beaten Khan once. No chance in hell he will fight again.